I have a tendency to be a little over optimistic about gardening. I get a little excited and plant too early. Frost is my first problem. I find myself replanting tomatoes that freeze in late frosts. Then the real trouble starts. All that freshly-tilled, beautiful garden soil begins to produce demon weeds. At first, they come in small and unintimidating. Then the first spring rain comes, the sun warms things up, and the weeds take on supernatural characteristics. In all my research about the best options, I found several methods I thought I would combine. I haven’t seen anyone combining all these methods, but they are all related and I think they are very compatible. First, I broke the cardinal rule on no till/no dig gardening because if one method I wanted to employ. My first goal is to feed and build my soil. I have really great soil to begin with, but I wanted get started right and rebuild where I had to disturb it. My first method to employ is hugelkultur. Hugelkultur is a water retention method. 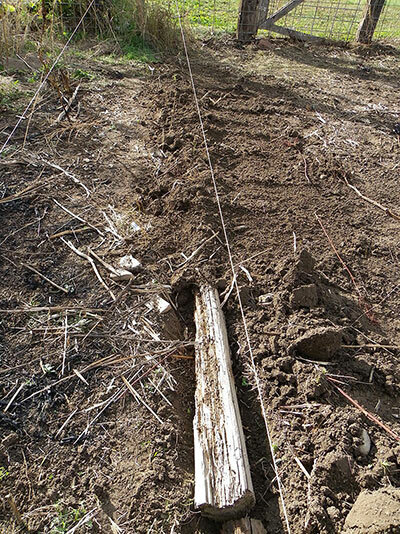 Typically, you place rotten logs on the ground, then you cover the logs with soil, compost and mulch. You plant right into the mound and the rotten logs act as a sponge to hold water. 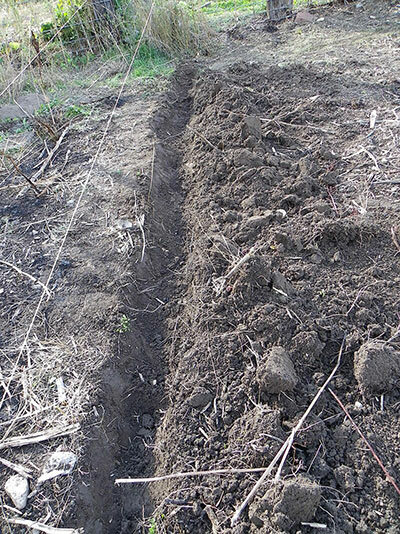 Often, hugelkultur is used in permaculture berms to extend the benefits of both. Living in a high desert region, water retention is very important. I dug a trench about the width of my shovel and about half the depth. 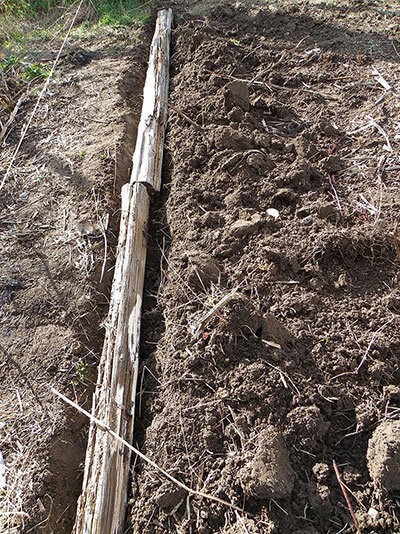 Then I placed some rotten logs I got from a local classifieds site for free into my trenches. Then I backfilled the the trench with the dirt that came out of it. I collected my compost that has been curing for two years. 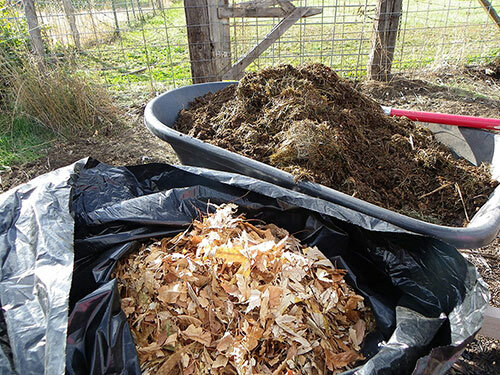 It is a combination of cow, rabbit and chicken manure, along with wood shavings and straw. Isn’t it pretty? I also collected bags of leaves from the local elementary school. The principle was thrilled. Not only because he didn’t have to pay someone to do it, but he felt it was good to have one of my sons come do some community service. In the first row, I covered the soil and logs with leaves then compost. I the other two rows I did the compost first, then the leaves. That goes along better with the natural mulch and composting method described at Backyard Ecosystems. 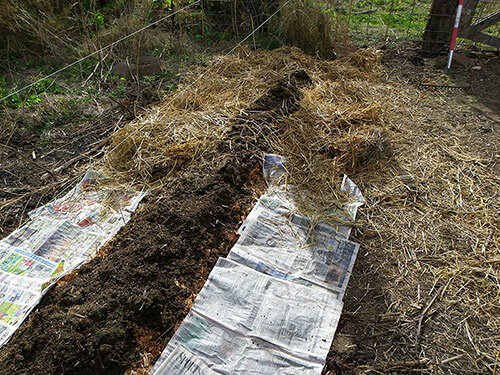 To continue with the Backyard Ecosystem method, I then laid 4 layers of newsprint down between the raised rows and covered it with 3-4 inches of straw. 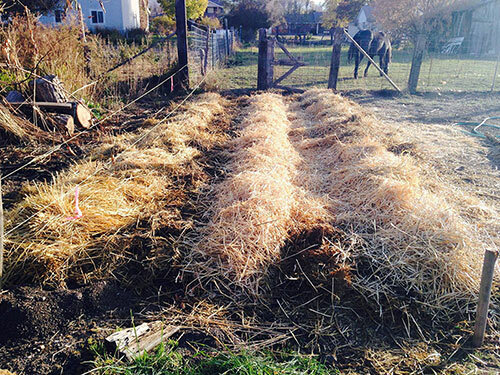 This is a great use for the pile of straw that the tarp blew off of then got buried in snow. 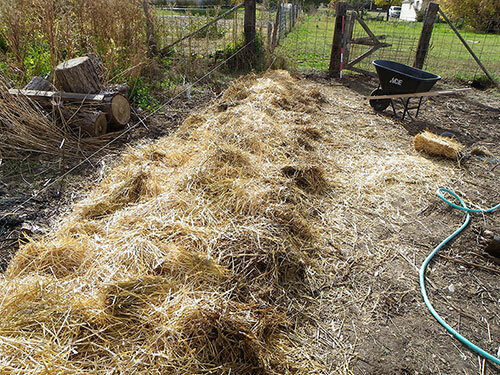 The last step was to add 3-4 inches of straw on top of the compost and leaf mulch. It comes out looking very much like the raised row method I found at Old World Garden Farms. The next weekend, I added two more rows with the leaf layer on top of the compost. 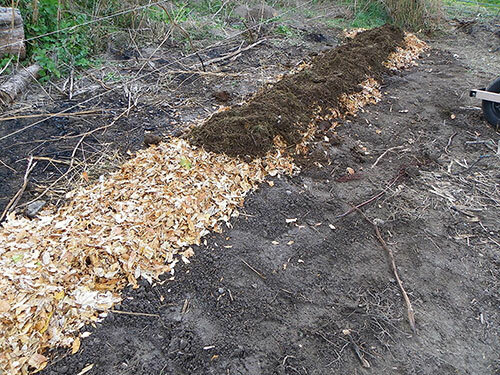 This mimics Nature’s composting method of layers of differing degrees decay and composting. This is the type of environment your plants expect to live in. With this mixed method gardening, I hope to benefit from happier soil, better water retention, and fewer weeds. I’ll post again in the spring when I plant, then we’ll see if I have the super garden I’m hoping for. A couple of years ago, a came up with a design for raised beds. It’s pretty simple, but I had more than one person ask if it was a cow coffin. Granted, they are large and deep, but they sure are easy to use. The design is very simple and I intend to get my plans on here soon. 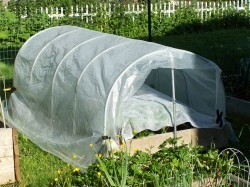 Today, I would like to share this video of a simple hoop house or mini green house to use with my raised bed design.